Visual Studio Code>Other>Cacher - Code SnippetsNew to Visual Studio Code? Get it now. Code snippet library for pro developers. Access your personal and team snippets across all your devices. Pro tip: Your credentials are saved in .cacher/credentials.json under your OS's home folder. This file is also used to authenticate other apps, like the Cacher CLI. Change Cacher's default behavior (Preferences > Settings > Extensions > Cacher). Cacher's default shortcuts can be configured via the Keyboard Shortcuts editor (Preferences > Keyboard Shortcuts). 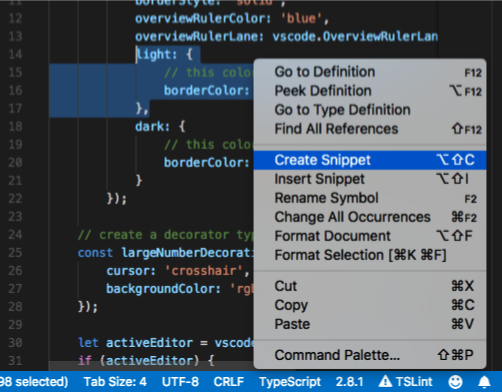 The Cacher VSCode extension is available for registered users on a Pro/Team plan. For a 14-day free Team trial, sign up at app.cacher.io.